I've been practicing watercolor now for 6 or 7 years. 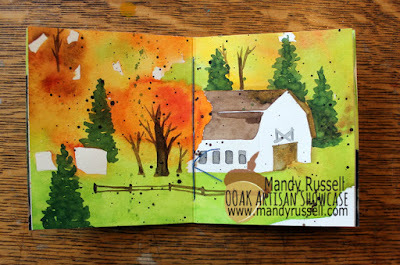 I just love the medium and have amassed quite a pile of past watercolor artworks. 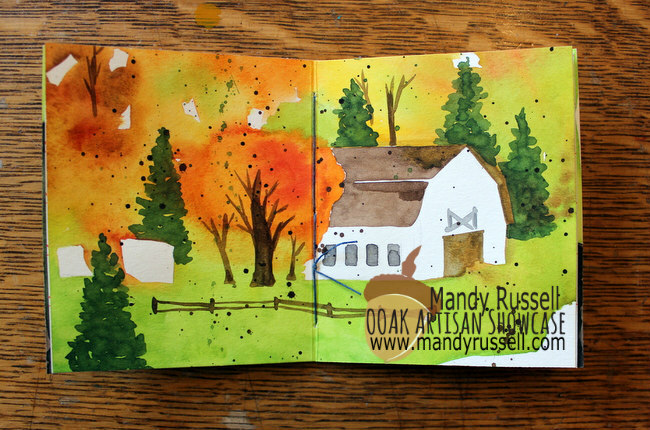 I usually sketch and paint something, take a picture of it, post it to Instagram, then toss it in a pile. Since watercolor is done on paper, it's easy to tuck them all away in the studio somewhere, never letting them see the light of day. I save it all; anything from hideous mistakes to masterpieces. It ends up in a spot I lovingly call my paper graveyard. The paper graveyard isn't for just watercolors either, it's for any art done on paper. 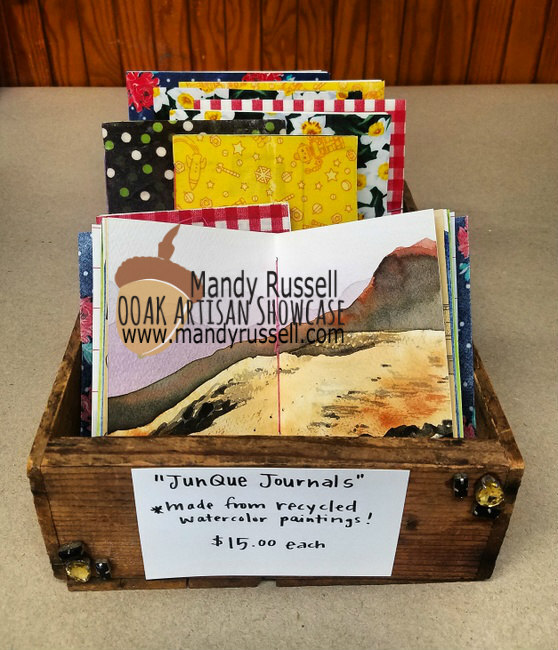 These sweet little books make great use of that paper graveyard stash and make the most thoughtful gift for that special lover-of-handmade-items. 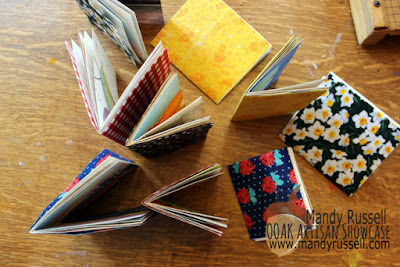 I usually make these books in batches, as you can see. 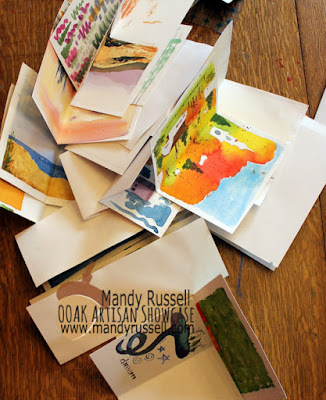 I start by harvesting a bunch of watercolors from my paper graveyard. 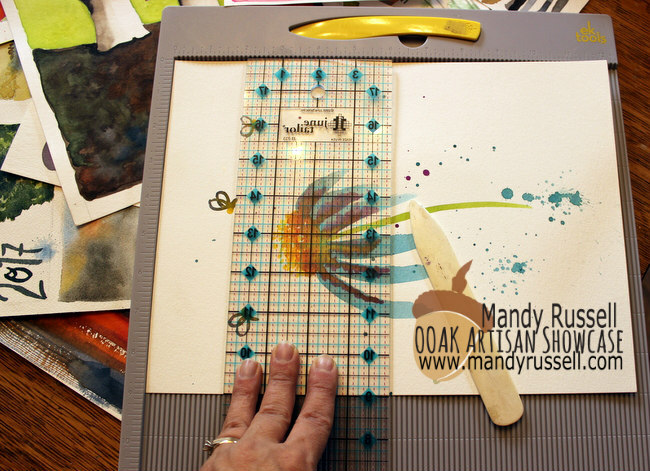 I score them down the center using a bone folder, a clear acrylic ruler and a score board. If you don't have a scoreboard, I highly recommend one. As a book maker, this plastic tool has changed my life! EK Success makes a fantastic one. After scoring, I fold them in half and crease well. Then I trim them, still folded, all to the same size with a guillotine-style paper cutter, you know, the kind with the arm. 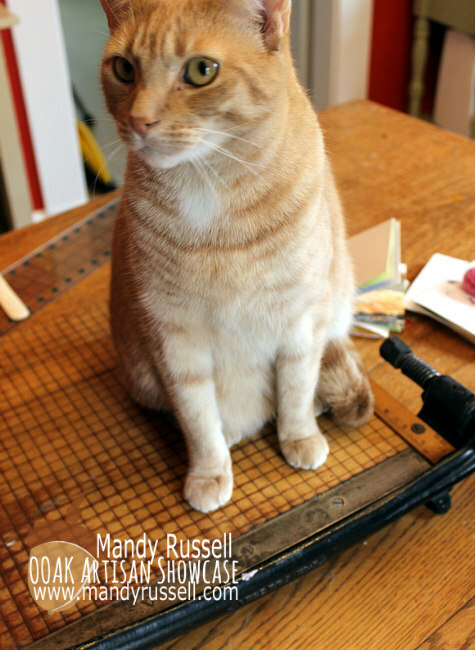 Here my cat, Randy, is "helping" me cut by sitting on my favorite vintage cutter. Watch your tail, Randy!!! 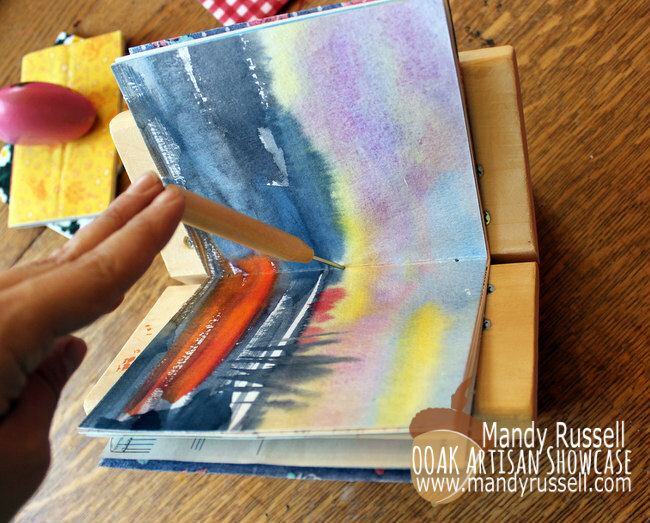 Now, since watercolor paper is so thick, you really only need three folded paintings to make one book. I add other vintage paper to my books, such as sewing pattern instructions, chart paper, or lined paper. I score then cut this paper to the same size as the rest. Pick out a cover. 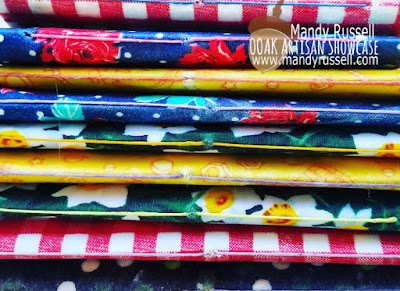 I use heavy duty fabric, like canvas or home dec weight. Something a bit stiff works best. Trim your cover to match the size of the paintings. It should be ever-so-slightly larger but not by much! I use a rotary cutter here to get an exact cut. Nestle the three folded and trimmed watercolor paintings together to form a signature. Add any other papers you see fit. To "nestle" just add one inside the next, inside the next, inside the next, and so on. Place the bundle inside the cover. Open the whole ensemble and lay it on a self-healing mat. (I use a punching cradle as seen in the picture) Along the center crease, using a sharp awl, pierce through the entire bundle, cover and all, in three spots. Pierce the first hole roughly in the middle and the other two holes about a half inch in from each edge. Next thread a large needle with about 18 inches of waxed thread. Stitch through the middle hole from the inside of the book towards the outside. Leave a tail about 5 inches long. Move the needle and thread to the bottom-most hole and stitch through it. The needle is now back to the inside of the book. 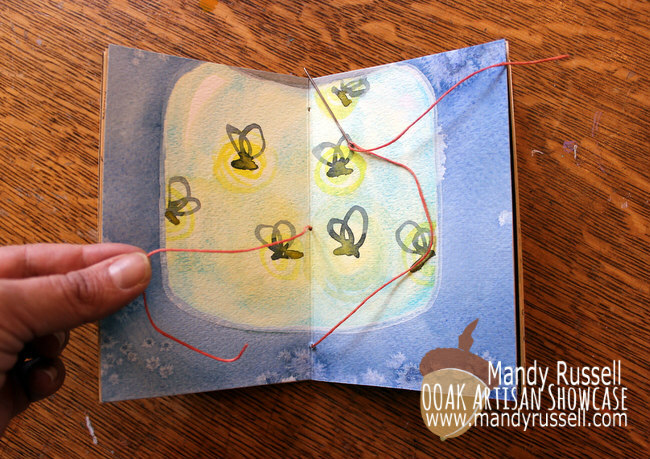 Enter the middle hole again, stitching through to the outside of the book, and pull the needle and thread taught. Next enter the top-most hole, pulling the needle and thread through to the inside. Remove the needle and tie the two thread ends together to form a square knot. Voila! 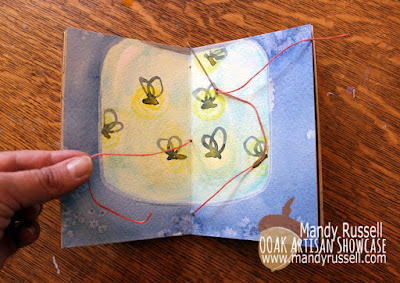 A simple pamphlet stitch book with meaning. A fabulous way to give homage to that past paper-based artwork. I love turning these little gems into art journals, giving them as gifts, or as you can see, selling them at artisan fairs. 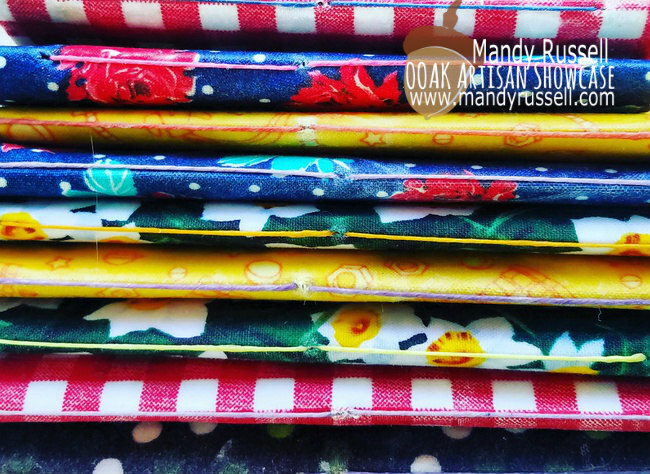 You can see more of Mandy's creations online!